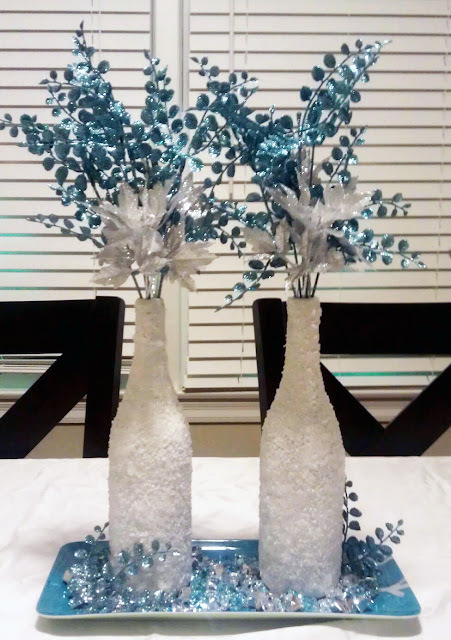 Do It Yourself Craft Ideas! I transformed these old wine bottles into a "Winter Wonderland"centerpiece for my dining room! 5. Tray or charger to put the finished bottles on. Step 1: Spray the empty wine bottles with a thin coat of primer. Once the bottles have dried, repeat Step 1 until the bottles are completely covered with primer. Step 2: Once the bottles are dry, spray them with a clear adhesive spray. You can find this at any craft store. Step 3: Immediately roll eat bottle in Epsom Salt. **Make sure to place the Epsom Salt on wax paper for easy clean up. Let your bottles dry for 10-15 minutes. Don't worry if you missed a few spots! You can always respray those areas and roll your bottle back in the Epsom Salt. Doing this won't cause any damage to the areas that you previously sprayed/covered with Epsom Salt. Step 4: Just insert your picks, place the bottles on your tray or charger and you're done! This is a quick and easy project! I would love to do this for our office holiday luncheon. Is there a specific reason that you use spray primer instead of spray paint? I bought the Rustoleum 2X Spray Paint with Primer. Good or no?